☛ Metropolitan Museum of Art: “New Year’s Eve Foxfires at the Changing Tree, Ōji”, Utagawa Hiroshige, ca. 1857. 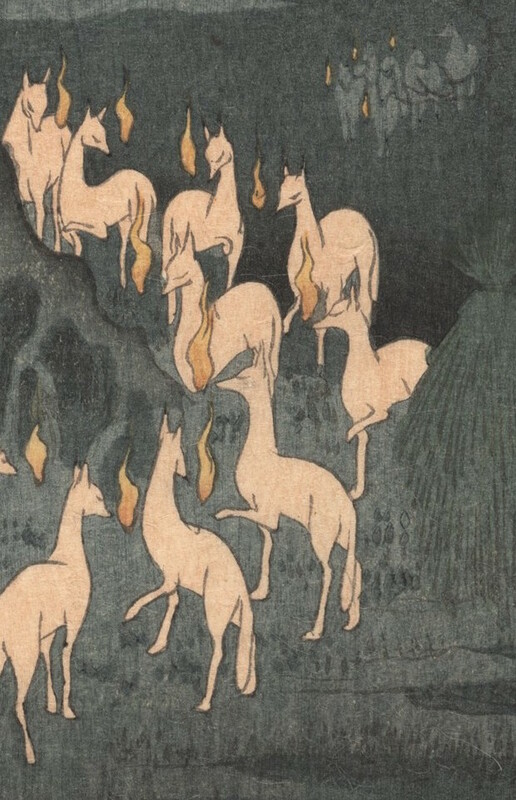 Polychrome woodblock print; ink and color on paper, 12 13/16 × 8 5/8 in. (32.5 × 21.9 cm). Rogers Fund, 1925. Accession Number: JP1470. 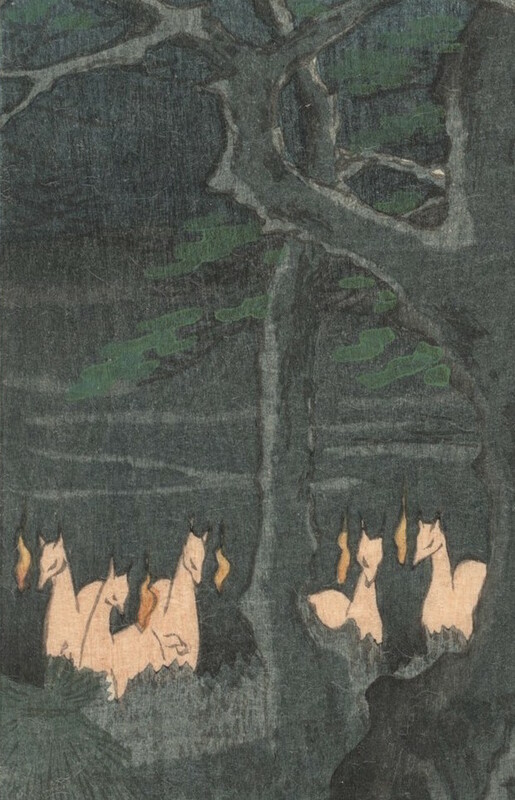 Hiroshige, at the height of his powers, demonstrates his ease with the vertical format and takes it to new heights, as can be seen in the contrast between the darkness of the night and the white of the animals in New Year’s Eve Foxfires (…) (Peter Lang, 2010, p. 105). In Japanese folklore the fox is considered to be a most mischievous animal. The wily fox is thought to have the ability to change form, usually into that of a beautiful woman, playing tricks and pranks on unlucky people. Foxes are also believed to be able to breath fire and to make fire by rubbing their tails together. Legends abound in Japan of men, oftentimes priests who wander through mist-filled moore late at night, and see a distant flicker of flame and think it is a lone hut that will provide a welcome refuge from the cold and dark. In truth, the flame is that produced by the fox to lure the hapless wayfarer to mischief or worse. 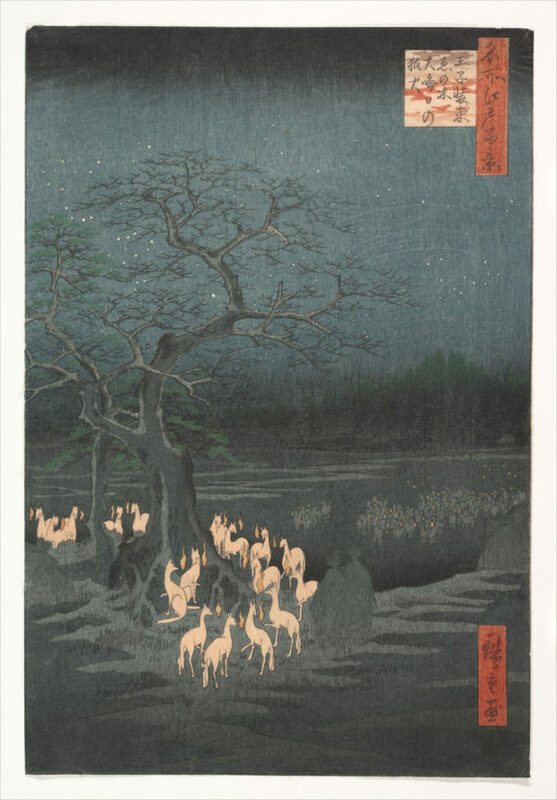 There are a variety of reproductions of this woodblock print available online: Brooklyn Museum, Honolulu Museum of Art, Norton Simon Museum, Boston Museum of Fine Arts, The British Museum. The very useful site Ukiyo-e Search offers links to 21 different versions.